It’s has been a fun and exciting evening out on the town with your friends. You are walking back to your car and you turn down a dimly lit side street, you see a shadow dart across and then you hear footsteps. Th hairs on your neck stand straight up. So you start to walk even faster, but the other footsteps speed up as well. You are looking all around trying to make out the shadows and shapes in the darkness, then out of nowhere you get sucker punched right in the side of the face. You go hit the ground and you feel you wallet being taken right from your pocket. Before you have time to react, your attacker has disappeared into the cover of darkness and you are left all alone. If you are like most people out there, you typically think of flashlights as something you keep in your kitchen drawer in case the power goes out, or as something you take on a camping trip so find your way to the tent. But according to may self defense experts a flashlight is something everyone should have at all times. It is an easy tool that anyone can be comfortable handling in a time of need. What is a self defense flashlight? A self defense flashlight is simply a flashlight that’s has been designed for defending one-self or property. 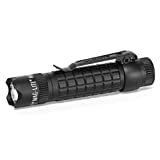 Many of these types of flashlights fit within the tactical flashlight category, which is usually for military or law enforcement. Many are designed to be mounted on the ends of weapons. They are typically smaller in size, made from metal or aluminum and emit much more light than the one in your kitchen drawer. While tactical flashlights are a great choice for a self defense flashlight there are a few special features to consider when searching for your next personal defense flashlight (see below). Why everyone should carry one. Before we get into talking about the weapons themselves, lets talk about why you should carry one. I can’t count the number of times I hear on the News Stations another victim being attacked and brutally beaten. It is unfortunate that there are people in this world that fit the description of the “Agressor” and I wish we spot them coming from a mile away, but that is not the case most of the time. As civilians, we need to arm ourselves with a few weapons that can cause some serious pain and anguish to an attacker if we ever find ourselves in a situations like that. Now I carry a flashlight everyday. you never know when you are going to be faced with a situation that requires one. Take for instance the other day, I was working at my desk and the computer monitor and phone system was acting up. I did a little trouble shooting behind the desk and found the reason. The power cords had been smashed between the desk and the wall so that it was coming out of the socket and just flickering the monitor every time scooted my chair up to the desk. I would have never been able to realize this if I did not have my handy flashlight with me. Now that did not require me to use the flashlight as a self defense weapon, but my point is that you never know when you need to use one. So why go without especially with the potential crimes and every day use as well. You will find it to be a well made investment. Which one is the best self defense flashlight? Designed with extensive input from military tactical consultants, and yet suitable also for civilian use, this crowned-bezel version of the MAG-TAC® LED flashlight comes with a detachable pocket clip and features three modes: Momentary (in which the light stays on only while the switch button is being pressed); Full Power for a dazzling, 320-lumen beam that can light up an object two football fields away; and Strobe for a high-energy 12 Hz strobe that can disorient an opponent. All functions are selectable through Mag Instrument’s tailcap-switch-activated “Quick-Click™” mode selector. National Tactical Officers Association (NTAO) certified making it suitable for camping, car repair, climbing, fishing, household use, hunting, etc. Larger than the Maglite, the Eagle Tac T20C2 is truly a tactical flashlight with the user in mind. It contains the Cree-XM-L2-U2 LED bulb that produces a cool white light instead of the natural light. Made from aluminum and also has the raised bezel for maximum impact damage. Around 860 lumens is sure to give the attacker a run for their money. Designed by police and law enforcement The Lightning Strike Personal Protection System is designed specifically to reduce the incidents of assaults, and overall violence against women. It is designed as not just a product, but an overall personal protection program for women to utilize on college campuses, while jogging or walking, or even just strolling to their car in a dark parking lot. The system includes the only tactical flashlight specifically designed as a personal safety product for women, as well as a personal alarm that emits a 120 decibel shrieking alarm when activated. The Lightning-Strike Personal Protection System makes a unique gift for a loved one. It comes with a neck lanyard, attractive leather quick deployment holster, and tough coiled polymer light lanyard. The Surefire E2D LED Defender Ultra is a compact 500-lumen flashlight featuring dual-output capability and self-defense enhancements. Utilizing a virtually indestructible high-performance LED and a Total Internal Reflection (TIR) lens, the E2DL Ultra is activated with a pushbutton tailcap click switch that also selects output levels: press or click once for a high-intensity 500-lumen white-light beam—ten times the light needed to overwhelm the night-adapted vision of an aggressor. Return to off and press or click again within two seconds for a 5-lumen ultra-long runtime low beam that’s suitable for navigating at night or performing close-up tasks for hours. The Defender’s crenellated Strike Bezel provides further defensive options should the need arise. Slender and powerful, the E2DL Ultra is an ideal everyday-carry light. When searching for a self defense flashlight, the best thing to do is buy the one that fits your budget as well as your need specifically. If you are going to carry it in your purse or handbag, it should be relatively small but yet tough. Also there are some really great self defense classes available to help prepare you even more. Good luck and stay safe!